So today, two of my favorite MTC teachers collaborated to take a field trip out to the Kuo Yuan Ye Museum of Cake and Pastry. Not only is this place a museum, but it also houses a cooking school to teach you how to make your own pineapple cakes. I was looking forward to this the entire week. From what i've been told, you need at least 15 registered in order to reserve a cooking class. So I may not get another chance to do this with my friends. We arrived around 12:30 PM at the Shilin MRT station because it's just a short walk from it. We were greeted at the door and immediately wisked up to the 4th floor. We were apparently a bit late. Oops! The class was actually pretty simple. No fancy dough needing, no ingredients. You could barely call it a cooking class. But it was fun anyways, especially with fellow classmates. Anywho, they already supply the pastry dough. All you have to do is roll it into a cigar shape and size, then cut it into thumb-sized cubes. Then flatten it and place a pre-cut pineapple jam cube in it, then wrap the dough around it. The final part is the fun part. They give you these plastic paddles with various animal molds in it. Traditionally it would have been wood. 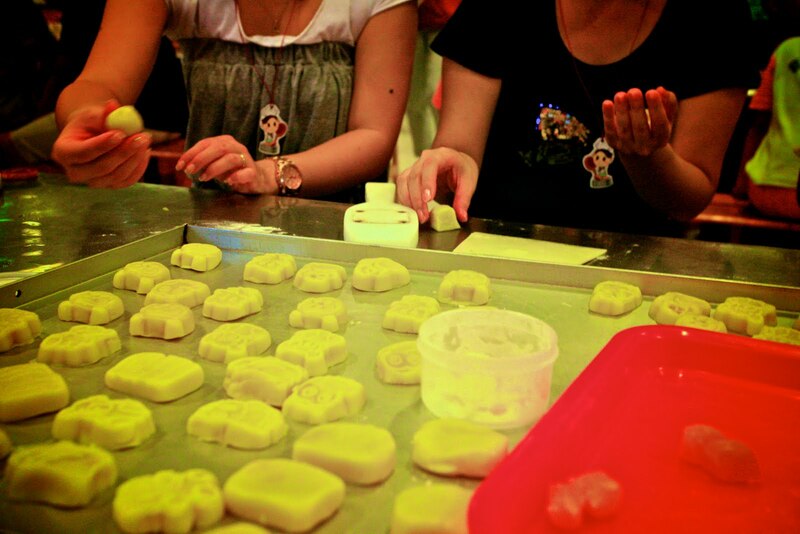 You dust your dough ball with a little flour and then pack it into the plastic paddle molds. Then you hit it against the table several times, very hard, on each side. Then flip it mold side down and give it a really HARD whack on the table to release it from it's mold. After everyone was done, they shuffled us into the museum section to learn a bit more of the history and tradition, while they took what we made and bake them in the ovens. They played fortune telling games and bouquet tossing. Apparently I'm getting married next year. First, the fortune telling. You ask a question and throw two red crescent shaped wood pieces on the ground. One up and One down means yes, everything else means no. Similar to the ancestral ceremony my family performed in Miaoli. Well the crescent pieces answered Yes. Then while I was taking pictures of the bouquet toss, it landed between my feet. And then once again, I was picked by the crowd to be the husband and throw the bouquet (I guess in chinese culture there is a male version too) to select my wife. Haha. Three times! Is someone trying to send me a message from above? We'll see next year. IF it comes true, it'll certainly make this day much more coincidentally significant! pineapple tarts, which region produces the best and any well know brands? And is it a special type of pineapple indigenous to Taiwan? what level of chinese are U at now? I don't know which region produces the best. It's not fresh pineapple so I suspect it's not that important. I'm not sure it's any special pineapple either. It's just a dessert cake popular in Taiwan. Chiate is a very famous brand for pineapple cakes here. Moa Chi(Chinese) or Mochi (English) is Japanese. Popular too, but originates from Japan. Chinese level...about intermediate conversational. Anything too complicated about politics or technical words I won't understand.